Pardon me, but I feel the need to call “bullsh*t” on something. It is NFL Commissioner Roger Goodell’s one game “pardon” of New Orleans Saints Coach Sean Payton, Assistant Coach Joe Vitt, and General Manager Mickey Loomis, to witness Drew Brees’ history making play at the Superdome in New Orleans on Sunday night. Not to take anything away from Brees, who with a 40 yard pass to Devry Henderson, broke Johnny Unitas’ 52 year record of 47 consecutive games with a touchdown pass. That is no small feat, and it’s a record the Saints quarterback will likely pad and hold for a while. Maybe forever. Congratulations to Drew Brees. But I’m calling foul on the visitor pass given the suspended trio to share the evening with the team, albeit from a luxury suite and not on the field. 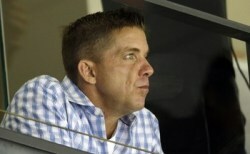 So as to avoid any look of impropriety, Payton sat alone and when he was on camera (which was often), he looked stoic. He was seen before the game visiting with Brees’ wife and children and did have a smarmy grin on at the end of the game, as the Saints picked up their first win of the season. Loomis and Vitt sat together and talked throughout the game, just not with Payton. Remember, people…these are three men banned from the NFL and the New Orleans Saints; Vitt for one more game, Loomis for three more, and Payton for the rest of the season, for the role their team played in a bounty program for injuries to opposing players. Former defensive Coordinator Gregg Williams is suspended from the NFL indefinitely. During the suspension, they are to have nothing to do with the team, the players, coaches, or employees. They aren’t even allowed in the buildings, on the grounds, or at games. Granted, the discipline process has been a clusterf*ck with a capital “C” (or is it a “K”? ), it’s been tried in the courtroom and the court of public opinion and has yet to be resolved. On Tuesday, Goodell reissued the Saints player suspensions, Defensive End Will Smith for four games, Linebacker Jonathan Vilma for the rest of the season, Linebacker Scott Fujita (Browns) one game, and Defensive End Anthony Hargrove (free agent) seven games. The players have the right to appeal the ruling. Again. Brees petitioned Roger Goodell for a one game reprieve so his coach, assistant coach, and general manager could be present for his NFL history making throw. I understand and respect that. But given the seriousness of the charges and the NFL’s crackdown on injuries, it was both inappropriate and hypocritical. It was also a huge distraction and if anything, took away from Brees’ historic milestone. I swear, I saw Payton on camera more than Interim Coach (Offensive Line Coach) Aaron Kromer and was even aware of his potty breaks. This entry was posted in NFL, Saints and tagged Drew Brees, Joe Vitt, Mickey Loomis, Roger Goodell, Sean Payton. It was September of 2007. Week two of the NFL season. Bill Belichick, head coach of the New England Patriots has just been fined $500,000 and the team $250,000 and its 2008 first round draft pick for illegally videotaping the defensive signals of their opponents. The media scrutiny was fast and furious. They questioned the legitimacy of the team, its record, its character. How did the Patriots respond? They finished the regular season undefeated, won two playoff games, including the AFC Championship, and lost their only game all season to the New York Giants in Superbowl XLII. It is April of 2012. The New Orleans Saints find themselves amid a mounting scandal over illegal bounties paid by the team for injuries to opposing players. Head Coach Sean Payton is suspended for one year, Assistant Coach Joe Vitt suspended six games, Linebacker and Defensive Captain Jonathan Vilma is also suspended for the entire 2012 season, Defensive End Will Smith is banned for the first four games, General Manager Mickey Loomis suspended for eight games and fined $500,000, the team is fined $500,000 and loses its second round pick in 2012 and 2013. Former players Anthony Hargrove (now signed with the Packers) will miss eight games and Scott Fujita (now with the Browns) will miss three games. Former Defensive Coordinator Gregg Williams, signed by the St. Louis Rams in the offseason, is suspended indefinitely. Can we expect the Saints to come out of bountygate much like the Patriots emerged from spygate? With a collective chip on their shoulder and a “prove it to the world” attitude? Nope. For one, the Saints are also in contract talks with team captain and star Quarterback Drew Brees. Brees has been tagged as a franchise player and is reportedly “livid” about it. The tag gives the Saints until July 16 to sign him to a long term deal. If they don’t, Brees will have to decide whether to sign the franchise agreement, which would pay him the league average $16.3 million for next season, or hold out. After which, the then 34 year old Superbowl winning quarterback could be tagged once more or become a free agent. The two sides are reportedly millions of dollars apart but are said to be communicating again as of recently. This Saints team has been dismantled by the fallout from the bountygate scandal and really has no choice but to sign Brees to the long term deal he wants. Down two coaches and a defensive captain, Brees is the only real leadership the team has until Assistant Coach Joe Vitt comes back in week 8 (following their week 7 bye). To have Brees playing under a short term bargain deal or worse yet, holding out, would be suicide for a team already reeling from the bountygate fallout. So no, don’t expect a repeat of the Patriots 2007 season. Don’t expect these Saints to come out with a perfect season and make a run at the Superbowl, which is hosted in their hometown this year. Not this team. Not this time. The best the Saints can hope for is for Brees to hold them together through a so-so season and look to rebuild in the near future. As for the Saints, there’s not much they can do but write a blank check to Drew Brees, then sit around and wait for the next gate…to take the spotlight off of them. Lord knows it’s already in the works. 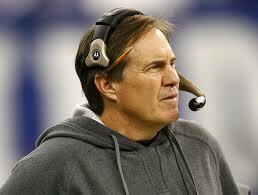 This entry was posted in NFL, Patriots, Saints and tagged Bill Belichick, Sean Payton. When I first heard this, I stopped and thought, “Did I miss something? 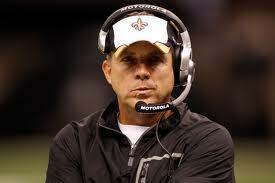 My God, what happened to Sean Payton?” I googled him and thankfully he is still with us. So, why would the team leave a seat open for someone who is still alive, yet suspended for failing to stop the team’s illegal cash bounty payouts? One word: protest. This is the Saints’ way of protesting what they deem to be harsh punishment from the NFL. And it is harsh. One year suspension. No contact with the team or players (or players from another team). Banned from all Saints facilities. The reason it’s harsh is that this was not an oversight. The Saints had been warned several times, and flat out ordered to shut the practice down by the NFL and team owner. Commissioner Roger Goodell made it clear when he handed down the sentence (the harshest in NFL history for a coach) that he had been lied to by the team and Sean Payton. So while Payton is on sabbatical, golfing, fishing, maybe studying film, the team will carry on as if he’s there. His empty seat will serve as his reminder. 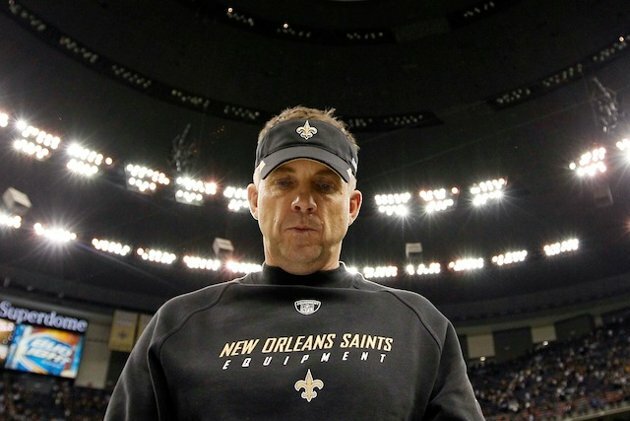 Payton will be eligible for reinstatement in the spring of 2013, shortly after Superbowl XLVII is held in New Orleans. Bet they get him a great seat. This entry was posted in NFL, Saints and tagged Sean Payton.